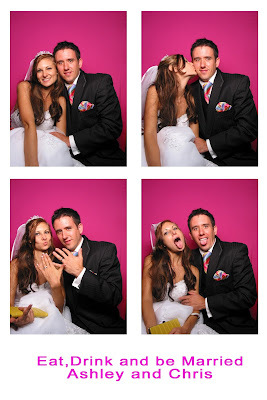 Chris and I went to Costa Rica and had the most amazing honeymoon!! 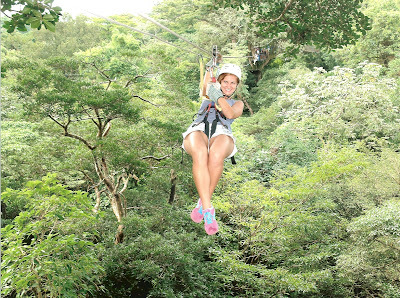 It was relaxing and adventurous! We layed out at the pool some days and then went zip-lining through the rainforest, horseback riding, ATV-ing on the beach....everyday was incredible....and it was absolutely wonderful being in another country and completely focusing on nothing but my wonderful husband! 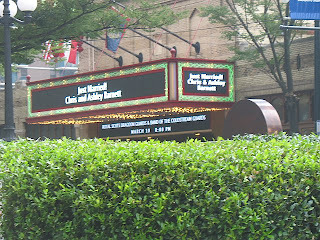 When we got to the reception site, the Fox Theatre, Chris and I took some pictures outside---we had our names put up on the marquee!! After pics, we met up with the wedding party to line up for our introductions.....right after that, we did our first dance to John Legend's "I Will Stay" then we had to cut our cake immediately because it was starting to collapse!!! We weren't too stressed out about it; honestly, it still tasted fine.....and it was the only thing to go wrong the entire day, so we were fine with it!! It took us over an hour to make it around to all of the tables, and I felt like we really didn't get to spend much time with anyone! But I'm sure all of our guests understood!! And of course, as we were warned....we didn't get to touch our food!! But our caterer was nice enough to wrap it up for us and we munched on it later that night in our hotel room!! Everyone danced and had a good time! My dad even paid extra to have the ballroom for another hour!! It was such an amazing night....most people told me that I wouldn't remember much...that the whole night would be a blur....but I remember every minute of it!! The day of the wedding went by so fast! First, I woke up at 7:30 because my nerves were really getting to me. I just could not relax! At 11:30, the girls and I walked up to P'cheen for brunch---this was thier bridesmaids' luncheon...ehem, "bruncheon." I was still so anxious and nervous that I could barely eat my breakfast!! When we got back to my house, my friend Mikka came over and did my hair and my little sister, Maddie did my make up. Then at 4:00 Kelly and I left to go to the park (the ceremony site) where we met the photogrpaher, Ricki Chester (she is SO great, by the way!!) 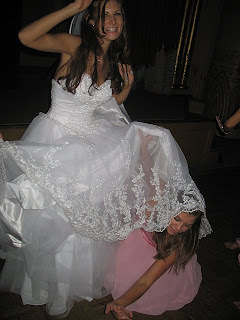 Then, the next 2 hours went by sooo fast.....we did a lot of pictures....me, the bridesmaids, my family, etc. Then at 6:00, Chris and the groomsmen arrived for their pics, so I had to hide in the room so he wouldn't see me! Then at 7:00, it was time for my father to eascort me down the aisle.....its strange, all throughout the day, I cried like a baby---overwhelmed with excitement and nerves and I was so afraid I was going to be a sobbing mess up there, but I actually did fine! No tears! 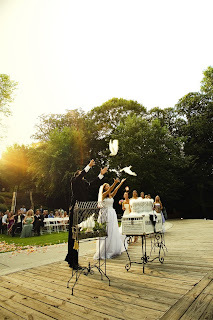 At the end of the ceremony, instead of a unity candle, Chris and I released 2 white doves....it was beautiful!! Its hard to believe its already over!! 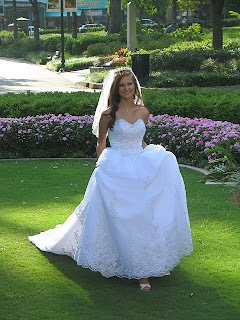 I got sick about a month before the wedding, so that did not make the planning any easier!! On Friday, the day before the wedding, I took the entire day off work and went to the spa....I got a Jurlique body scrub and wrap---very relaxing! Then I got a mini-facial (in a "mini" they do not do extractions----who knows how your face will react, and who wants to risk having a RED face on the day of their wedding!!) After that, I got a pedicure--French to match my nails I had done after that appointment!! After the pampering, I went back to my house where all of my bridesmaids met me. We hung out and then got ready for the rehearsal! The rehearsal went smooth, but boy was it hot outside!!! 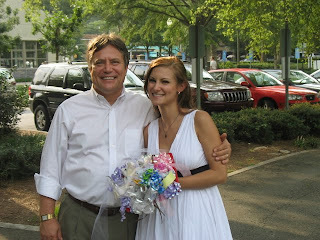 I totally forgot to bring the marriage license for the Pastor....but I did remember my ribbon/bow-bouquet!! Immediately after the rehearsal, we headed to Shout for the rehearsal dinner. It was so great to have everyone there. Chris' father gave a toast, as well as his step-father and grandfather and several of his groomsmen! Then my dad gave a toast welcoming Chris to our family---it was very touching....I cried and so did a few of my bridemaids!!!! Also, as a girf, my bridesmaid Bonnie made a slideshow of pics of Chris and I when were were younger, as well as once we've met each other....it was awesome! She did a great job on it!! After the rehearsal dinner was over, we went back to my house and my bridemaids spent the night with me....I made sure to say goodbye to Chris since we decided not to see eachother until the Ceremony!! !